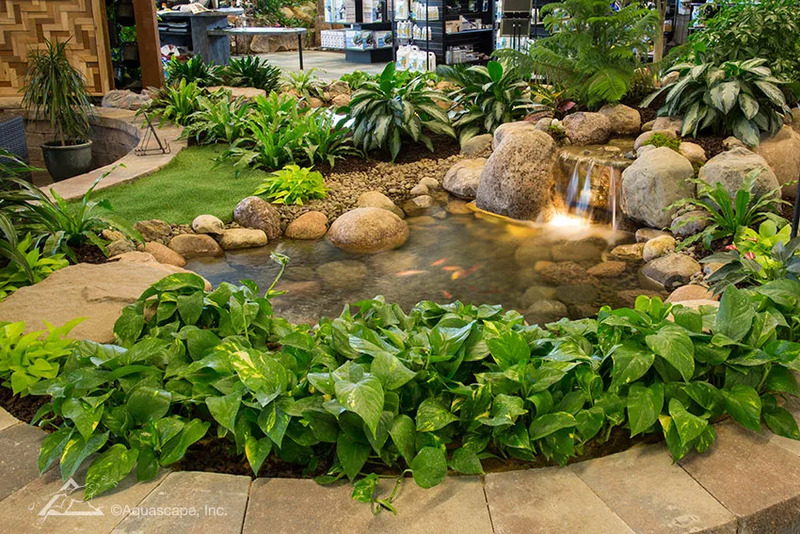 Visit our state-of-the-art Water Gardening Store and Inspiration Center for all your pond and water feature supplies. Our breathtaking displays will inspire you to create water features in your own yard to enjoy for years to come. Our professional staff will assist you in making sure you have everything you need to be successful at water gardening, whether you want to add a decorative fountain to your landscape or a beautiful ecosystem pond with waterfalls. Come shop our wide selection of pond supplies, live fish, aquatic plants, fish food, books, and more. 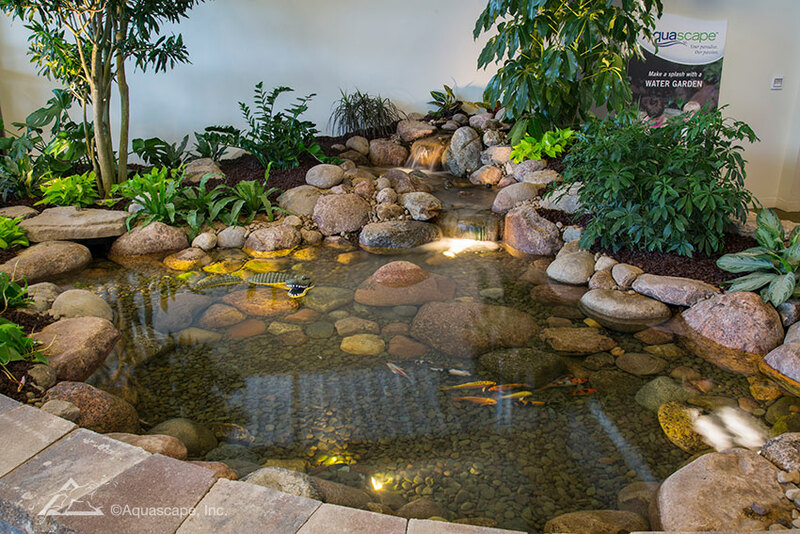 When you visit our full-service store, be sure to tour both our indoor and outdoor water features. 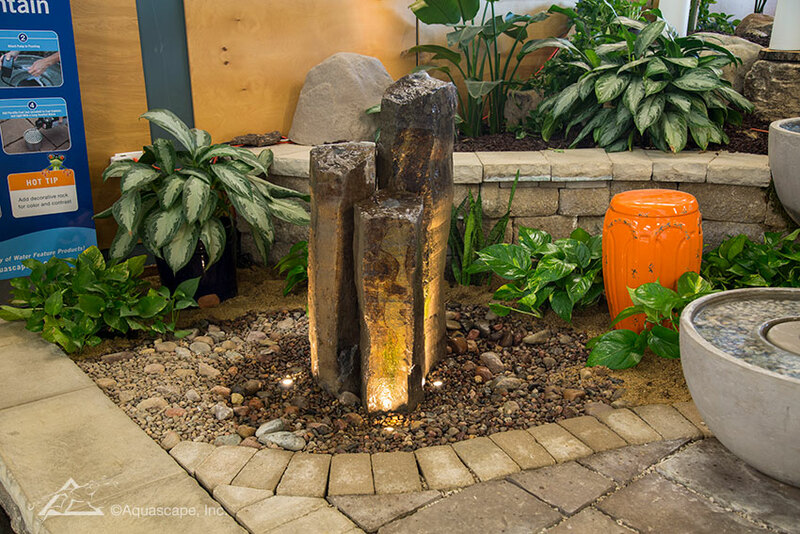 You'll see ecosystem ponds, Pondless® Waterfalls, an array of decorative fountains, and rainwater harvesting systems. Be sure to explore our 10-foot waterfall with a grotto for behind-the-falls viewing! This 7'x9' Aquascape ecosystem pond, complete with cascading waterfall, is ideal for small fish and aquatic plants. One of our smaller pond options, this water feature can make a big impact on your surrounding landscape. Fish and plants not included. Financing available. Ask us for details. This 7'x9' Aquascape ecosystem pond includes an extended stream, up to seven feet in length. This pond is ideal for small fish and aquatic plants and allows you to enjoy all the benefits of water gardening. 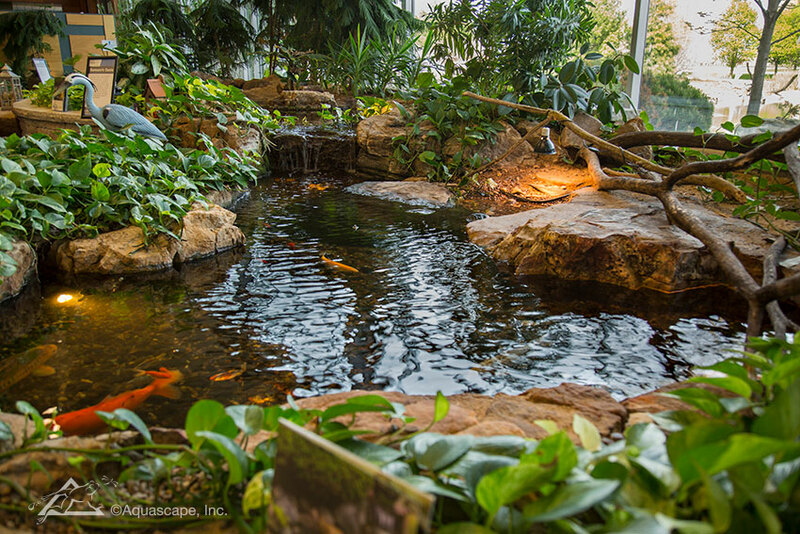 Our 10'x14' Aquascape ecosystem pond includes a 7-foot stream, which creates a comfortable home for fish and plants. This option is a great choice for residential yards and commercial properties. 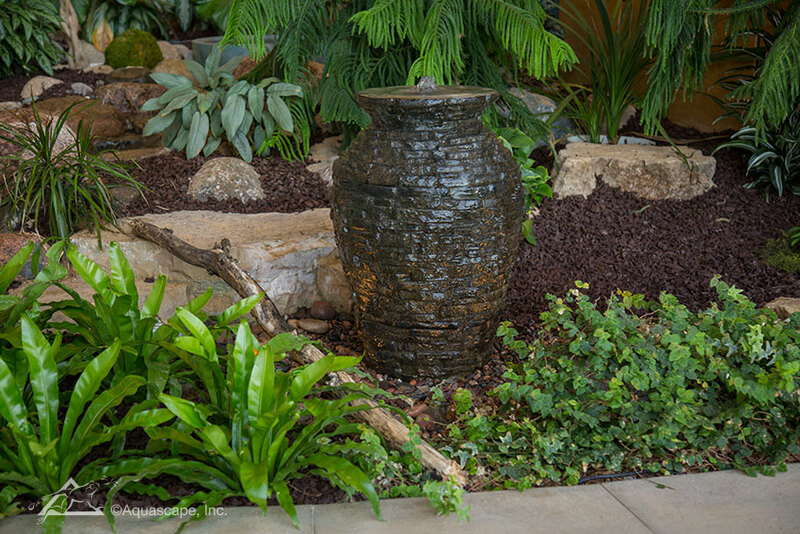 The Aquascape Medium Stacked Slate Urn is made from durable fiberglass and rock resin. This beautiful, medium-sized recirculating decorative fountain creates the soothing sound of trickling water, making it the focal point of any setting. The original Stacked Slate Urn, located in our AquaGardens, was started as a creative art project using leftover pieces of slate recycled from various waterfall and fountain projects. The small pieces were carefully stacked together to create a one-of-a-kind fountain masterpiece. The Pagoda Fountain Rocks are made from stratified limestone with incredible foliation. The unique shape of each rock provides a soothing, rippling effect as water cascades over the surface. 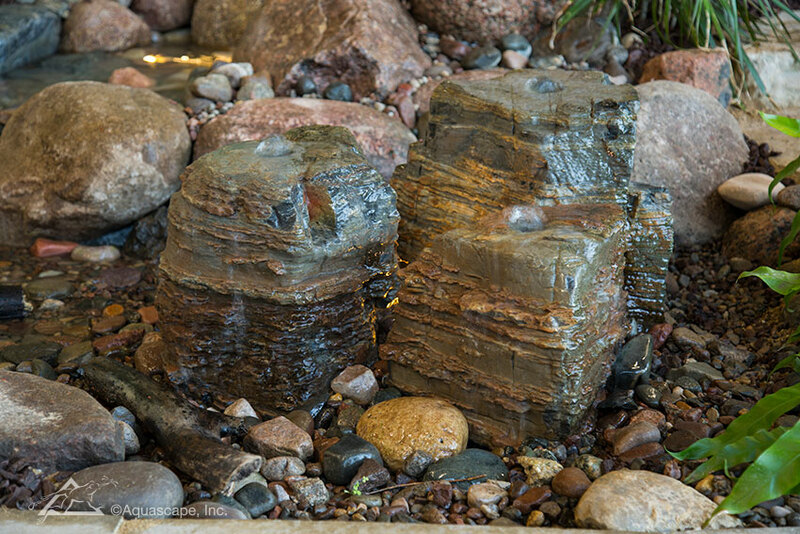 Available as a set of three, the Pagoda Fountain Rocks are sure to provide hours of enjoyment in your garden. 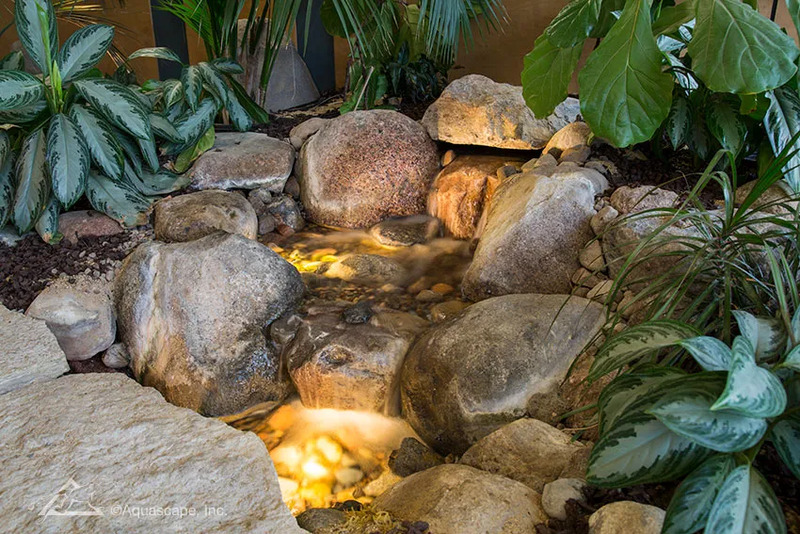 You are viewing a small Pondless Waterfall that can fit into almost any location. The water flows over the rocks and empties into a sub-surface reservoir which holds a pump. The water is then re-circulated to the top of the falls to begin the journey anew. This feature is ideal for adding the soothing sights and sounds of water to your garden spaces. 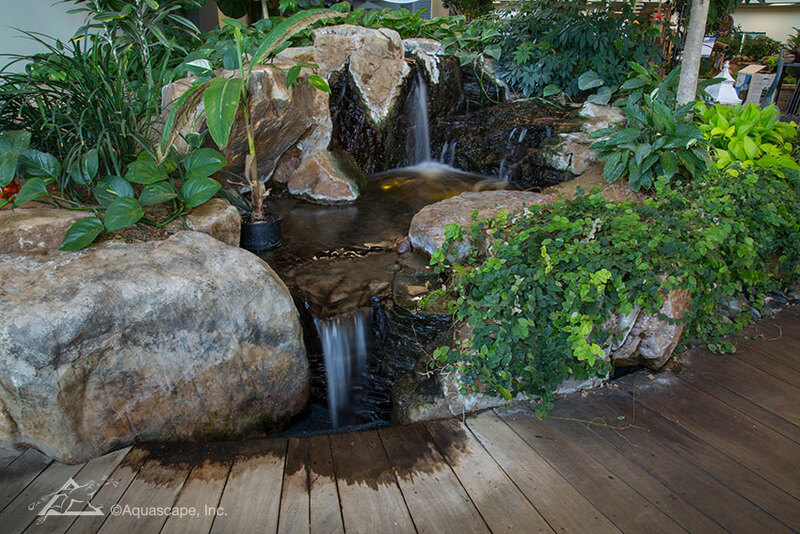 You are viewing the Aquascape Pondless® Waterfall, one of our most popular water features. Enjoy the soothing sights and sounds of water cascading over rocks before spilling into a sub-surface reservoir where the water is re-circulated to start the journey anew. This unique waterfall starts with our beautiful Spillway Bowl, which features a beautiful patina. You are looking at a large Aquascape ecosystem pond, which is ideal for fish and aquatic plants. This pond is currently home to 10 turtles and numerous koi. 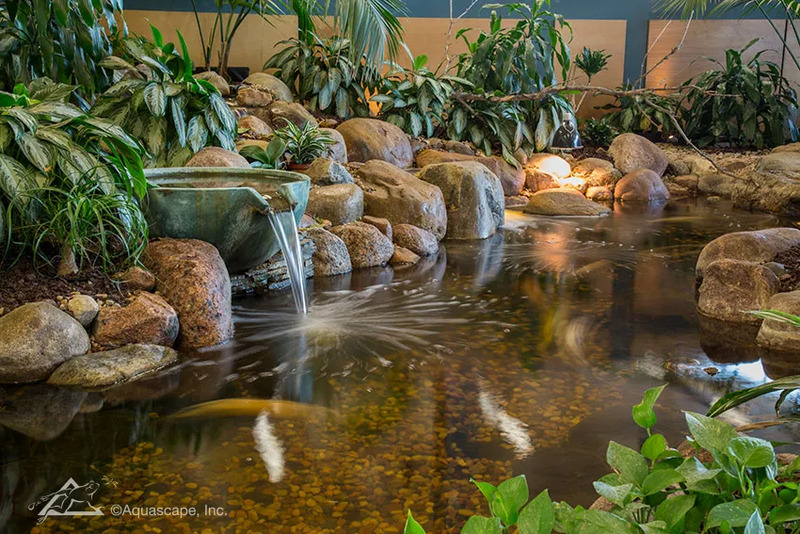 Greg Wittstock, owner and CEO of Aquascape Inc., built his first pond to house Samson, his pet turtle. Who knew a boy’s dream of owning a healthy pond for his turtle would eventually become a life-long journey of helping others enjoy the water feature lifestyle? Fish, turtles, and plants not included. 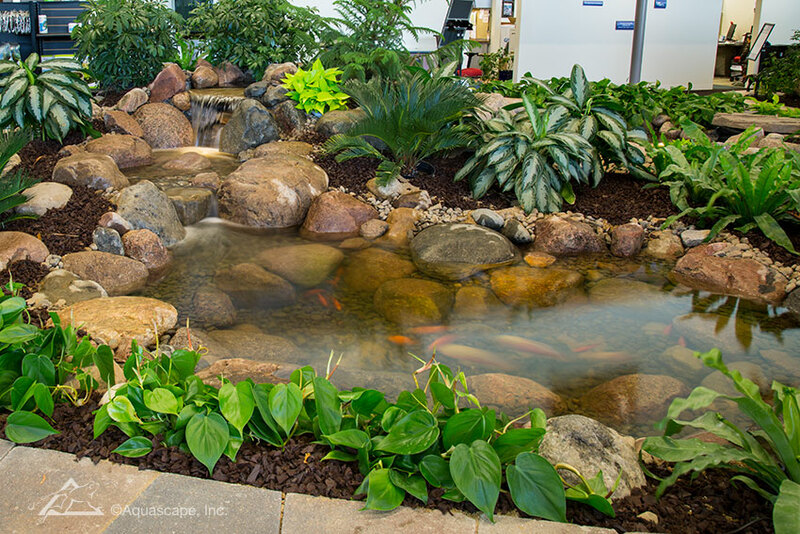 This large Aquascape Pondless® Waterfall was created with just six boulders. The water is continually recirculated up to the beginning of the waterfall and melodiously cascades over the impressive stones. 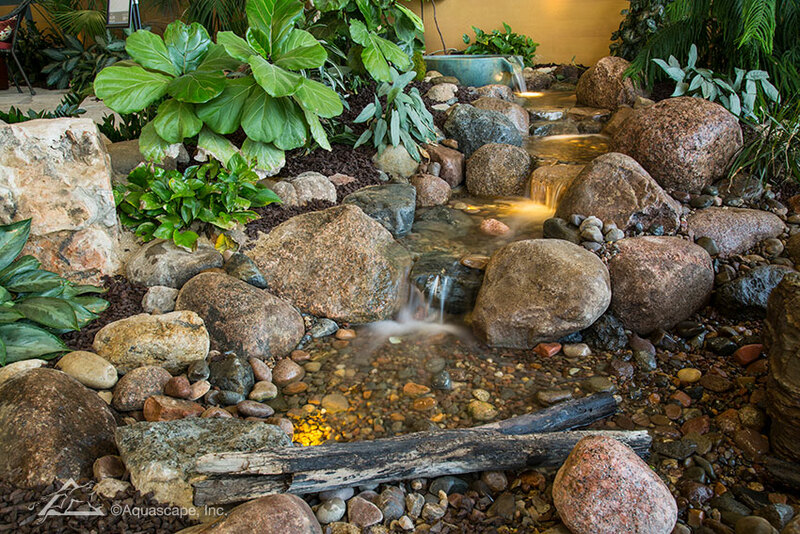 Add water-loving plants in and around your waterfall to naturalize and incorporate it into your landscape. This is our large Aquascape ecosystem pond with cascading waterfall. This pond is perfect for several healthy koi and a variety of aquatic plants. Watch the fish swim and feed them a bit of fish food. If you’re brave enough, you’ll find they might eat right out of your hand! Koi make great pets and kids love watching them glide through the water. Did you know that the oldest-living koi is over 200 years old? You are viewing the Aquascape Spillway Bowl and Basin, made from glass fiber reinforced concrete (GFRC) with a beautiful patina. The Spillway Bowl and Basin creates a soothing, spilling water feature. Keep the design simple with just one or two bowls, or link several together for an impressive display. Step outside to the AquaGardens and you'll see them suspended with decorative chains. You are looking at the Aquascape Mongolian Basalt Columns Fountain. This set of core-drilled stone from the Mongolian region creates a stunning water feature display. Add one near your front entrance to greet visitors, or place the fountain near a patio or deck. You’ll enjoy its melodious sound from inside the house when you keep the windows open. Our popular slate finish is now available in a sphere-shaped fountain. The uneven edges of the spheres create a unique sound in the garden as water spills over each edge. 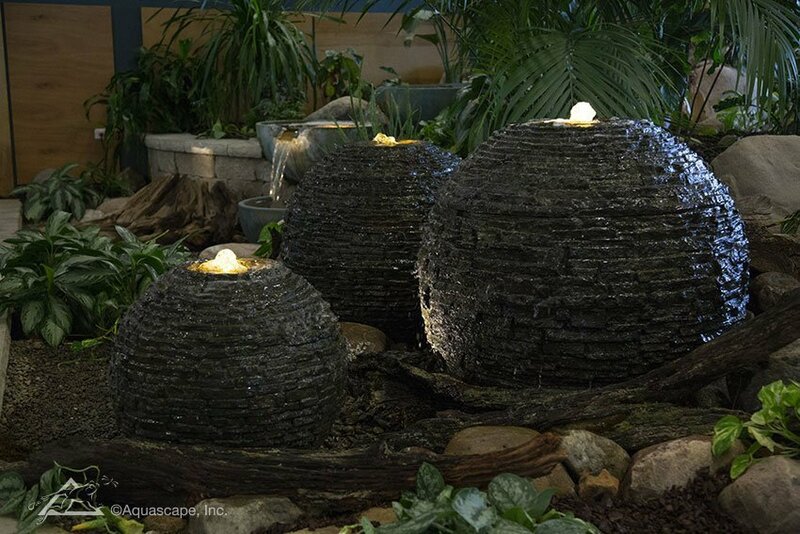 Enjoy just one Stacked Slate Sphere, or group the various sizes together for a truly stunning water feature display. 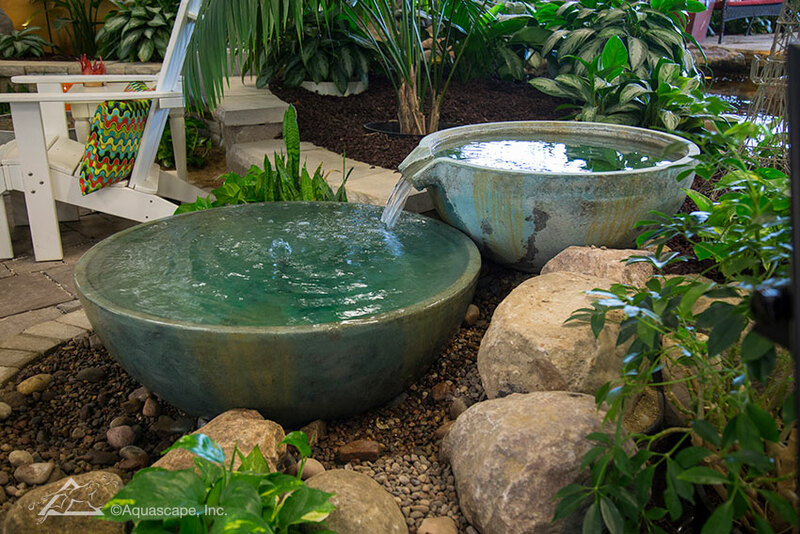 Take an online virtual tour of our Water Gardening store and Inspiration Center.